„ALL-WEATHER PERFORMANCE“ 365 DAYS A YEAR! „ALL-WEATHER PERFORMANCE“ 365 DAYS A YEAR ! With this year’s presentation of the new Badlands Pro, KLIM is showcasing the brand’s DNA in its purest form: guaranteed absolute protection against the rain, unparalleled ventilation including ventilated level 2 protectors and an intelligent pocket system, all in a chassis of light, extremely robust materials that will withstand any amount of strain. • “GUARANTEED TO KEEP YOU DRY®” laminated GORE-TEX® ensures dry and comfortable rides in all weathers! Thanks to the inner laminated membrane, the outer fabric absorbs practically no rainwater at all, meaning that the kit won’t become heavy and damp, sticking to the rider and causing him or her to feel cold. • The most effective ventilation system on the market: the laminated GORE-TEX® membrane in combination with watertight zips enables an unhampered ventilation, wicking heat and moisture away from the rider’s body and providing great wearing comfort at all times. 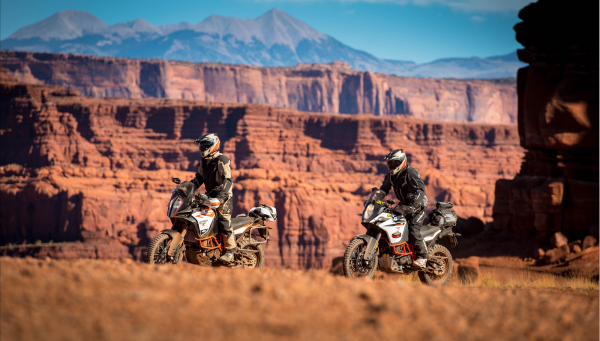 • The KLIM Lifetime Warranty applies to all materials used and to the workmanship – a great service that underlines our trust in the KLIM products. • A comprehensive layering system consisting of base and mid layers completes the KLIM range, allowing each individual rider to adapt perfectly to the prevailing temperatures. The remarkable thing is that this service package applies to all KLIM products. The products merely differ in their aim to meet the various customer needs as best as possible, resulting in their complex structure. At the heart of each KLIM product lies its purpose.